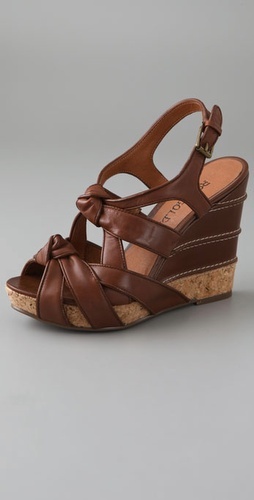 Miu Miu's cork and leather wedge sandals are $650 at Net-a-porter.com. I die. Get the look for a little less with Rosegold's Casey Knot Wedge Sandals, available in brown or black for $168 at shopbop.com. Credit for this fabulous find goes to Talk Pretty To Me! A few weeks ago I was invited to the Land's End Canvas Fall/Winter 2010 Collection Preview in New York City. Land's End Canvas, which just recently launched with their first collection in the spring, aims to attract a younger, cooler customer who still looks for quality and value—the hallmarks of the Land's End brand. The styles are American classics with a twist—think dark-wash pencil jeans, boyfriend cardigans and ruffle details on button front shirts. It's kinda like J. Crew meets L.L. Bean on a budget (everything's priced under $200, and that's for their signature trench coat. Most items are much less).